Riley Reed scores on two long TD runs for the Yachtsmen. FALMOUTH — Falmouth’s football team got the job done through the air last year. This fall, the surprising Yachtsmen are winning on the ground. 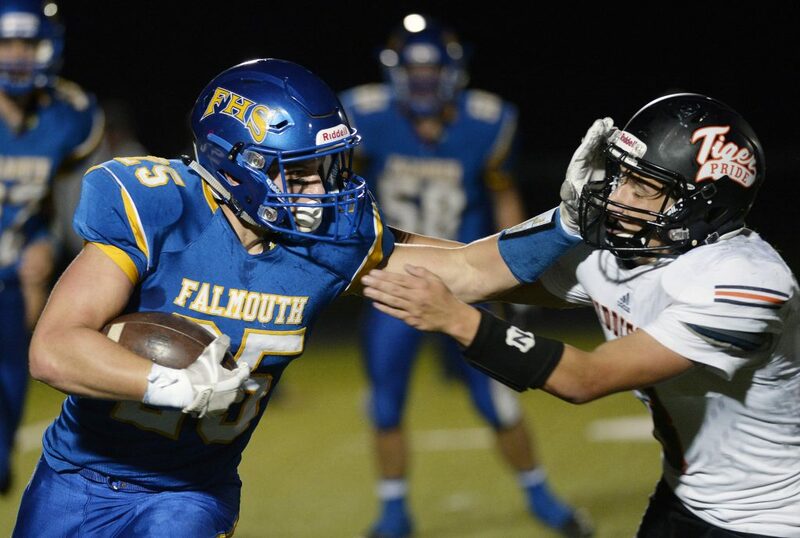 Falmouth ran wild against Biddeford on Friday night in a pivotal midseason Class B South showdown as running back Riley Reed rushed for 145 first-half yards and a pair of long touchdowns in Falmouth’s 27-18 win. 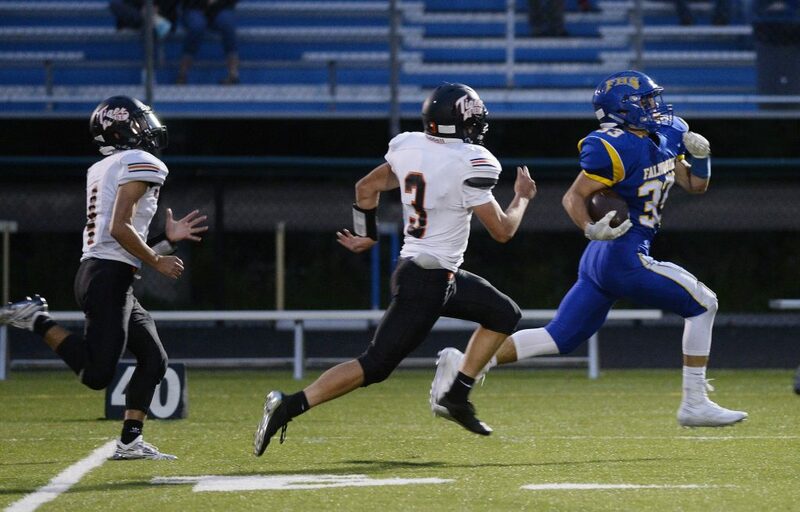 Reed finished with 180 yards and made some big plays on defense as well as the Yachtsmen (3-1) held off a late Tigers’ rally. 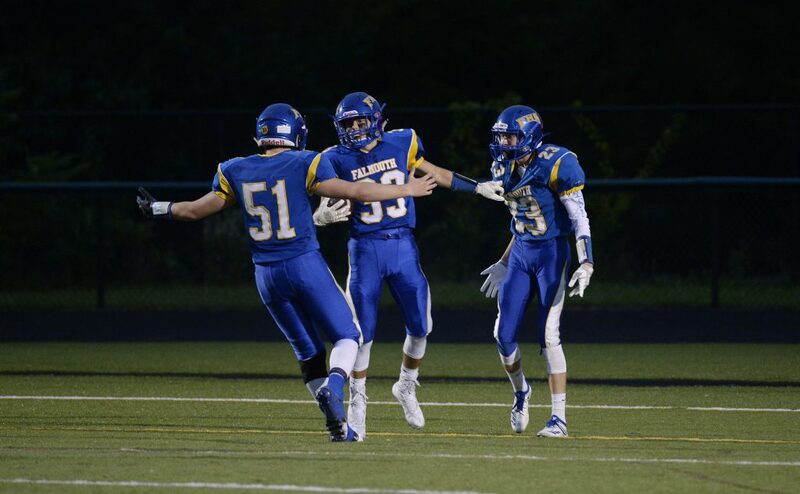 The Yachtsmen went ahead 7-0 on their third play, on third-and-inches from their 23, when Reed got the call, ran up the middle, broke free and outran the Tigers for a 77-yard score. After the Tigers answered on a 24-yard touchdown pass from Carter Edgerton to Scott Kelly (a 2-point conversion rush failed), Reed got the ball again and this time broke free for a 67-yard TD run on a sweep to the left for a 14-6 advantage after one quarter. 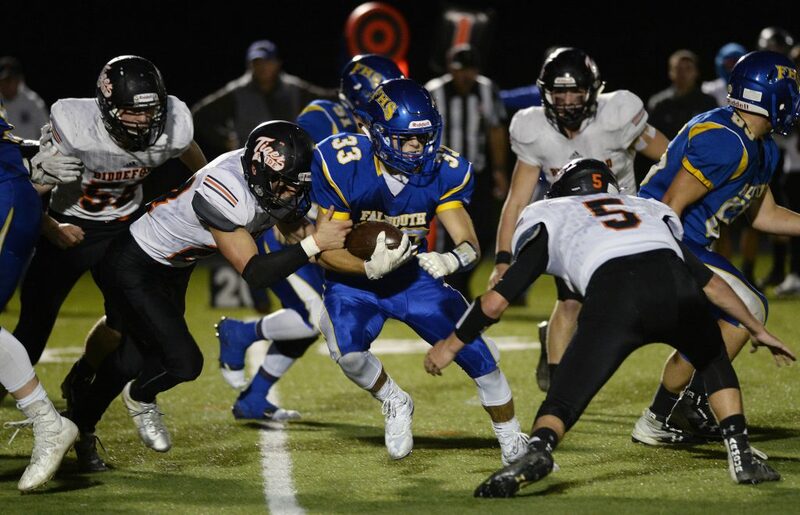 Biddeford had a pair of promising second-quarter drives falter deep in Falmouth territory and the Yachtsmen added to their lead when defensive back Evan Lovely intercepted a pass at his 38 and returned it down the left sideline for a 62-yard score. Sam Pausman’s extra point was wide left, but Falmouth held a 20-6 lead at halftime. The Yachtsmen, playing without quarterback Nick Mancini who hurt his ankle in the first quarter, managed to hold on in the second half. The Tigers cut the deficit to 20-12 with 4:14 to play in the third quarter when Edgerton (11 of 23 passing, 171 yards and 2 TDs) found Delano Voccia-Hale for a 40-yard score, but again, the 2-point conversion pass failed. Lovely caught a pass from backup quarterback Cooper Bush 33 seconds later, pinning the ball on his hip, then breaking free for a 59-yard score. 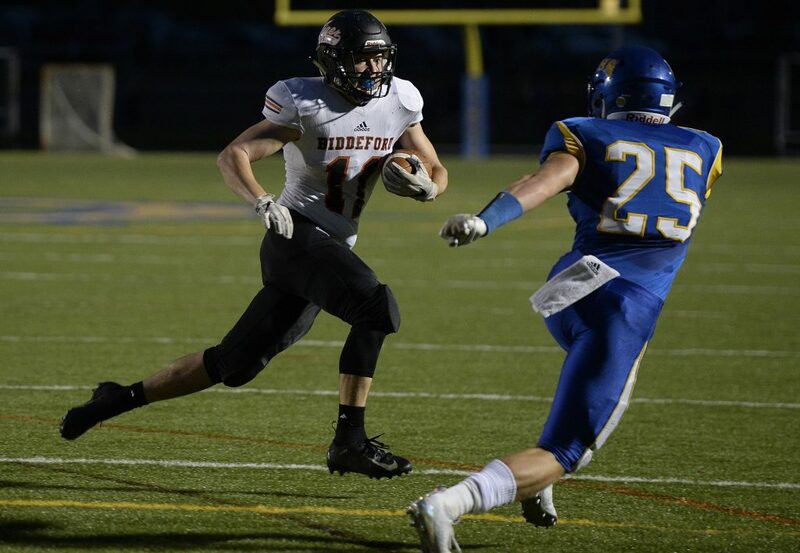 Biddeford scored again with 9:27 to play as Edgerton (14 rushes, 98 yards, 1 TD) scored on an 8-yard run three plays after Bush was intercepted by Alex McAlevey, but the 2-point conversion pass failed.